Will 35mm film become obsolete? Is film coming back? What about other types of analogue photography? The issue and discussion that is hard to avoid especially with quite a few news of hope that the analogue photography saw this year. 2017 has been an incredible year for the world of analogue photography. 2017 gave more hope that 2018 will be even better for film photography. Digital photography changed everything (no surprises here). Lots of photographers made a transition from analogue to digital. Digital photography even helps to showcase film photography in a new, better way. Digital brought lots of players to the photography, but some companies that served the analogue world have been going through tough times. Local stores and labs that developed film have seen an incredible drop in the volumes of business they get. While some of the businesses had to innovate or make a transition to satisfy needs of digital consumers others had no chance but to disappear. It’s the reality of any industry, not just analogue photography that has to adapt in order to be relevant. Nowadays, film photography is surviving with the help of keen enthusiasts who are brave enough to appreciate film. It might sound pretentious, but it is the truth. However, the circle of enthusiasts is growing. Giant companies like Kodak or Fuji have been able to stay in the business but had to bring new marketable products that help them to sustain the interest in film. Lomography is a good example of the company using the digital advancements to attract new people to film photography. Lomography managed to create a worldwide community of analogue products and gain a strong following. Why 2017 was so special for film photography? At the beginning of 2017, Kodak surprised pretty much everyone by announcing the return of its legendary Ektachrome film. Every film photography related website and film admirer couldn’t miss a chance to talk about the news back in January. It is worth to mention that Polaroid made it back with a bang by launching Polaroid OneStep 2. Also, Polaroid announced that the Impossible Project became Polaroid Originals. In 2017, announcements came not only from well-known brands but from smaller names that a lot of film photographers started to appreciate. 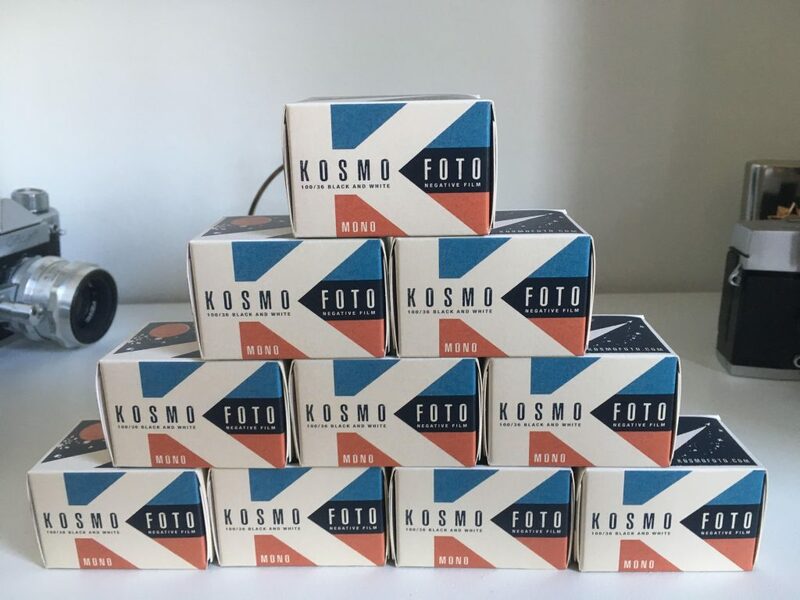 For example, Kosmo Foto launched its first black-and-white film and sold out the stock pretty fast. This year has seen a lot of analogue products seeking support on crowdfunding platforms. Some of the campaigns successfully raised enough funding while others struggled. A few campaigns were praised by the community, and a few campaigns got criticised. Letting the market to decide helps to filter out the best ideas. For example, Reflex managed to raise the target and will be bringing a new 35mm SLR camera with a unique modular design. The production plans are on schedule, and hopefully, we can see the project leading to something bigger in the nearest future. Unfortunately, Silberra did not raise what they were hoping for to establish a black-and-white film manufacturing. However, being quite a big analogue player within a Russian market, the company will amend the plans outlined before the beginning of the fundraising campaign. Silberra will use acquired money to make their film available to the mass market. Funding campaigns for the new 35mm camera Elbaflex and Hasselblad square instant back both failed. However, authors of both projects had a chance to reach out to the community and the potential market. Every crowdfunding project that might be a short-term failure can get something useful out of failing but gaining valuable feedback and improving their offerings long-term. JapanCameraHunter confirmed in the 81 episode of Sunny 16 podcast that the development of the new compact film camera is now under way but is more likely to be available for sale in 2019. However, it will not be a budget camera but will offer a great quality and servicing infrastructure to make sure that those who invest in it will get the value for money. We can also expect a new film with a new emulsion produced by JapanCameraHunter which will come out in 2019. During the same podcast mentioned above, Hamish Gill from 35MMC talked about the product he has been working on to make digitising photos better and affordable. So, is film coming back? A few products mentioned in the post will not come to life until 2019. Some of them might struggle or even fail. However, 2018 should be the year that analogue community becomes open to new ideas and products. It should be the year that sees more analogue products, services or other projects being conceived. 2018 should be able to end or at least reduce the amount of debate whether the film is alive. The analogue community is a genuinely incredible group of photographers that have at least a few common interests. All sorts of analogue projects that appeared during 2017 have been playing an important role of attracting more people to film photography. The attitude towards analogue photography has been changing. Film photography is not being seen as something that a group of people is trying to preserve but more of a broad niche within the photography. And more people should enjoy film photography. It is clear that 2018 is going to be more than just a year of hope for film photography. All worthwhile projects, products, phonebooks, zines and services should find its support within the community. However, new products and services are only a part of what gives us more hope, and we should play our part by supporting them. The film is not coming back, it has been around for a long time. There is also the PONF Multiback Open Camera project, we are making a reflex with interchangeable 35 mm film and full frame / APS-C digital backs. The project is starting prototyping and it’s an open one, so everyone can participate. Hi, thank you for your interest about the project and for the offer of sharing the news. About the crowdfunding, we would like to go directly for a pre-sales campaign. Crowdfunding could be amazing but, from an industrial point of view, takes away a lot of energy at an early stage, as you cannot directly finance the project as an investor would. As we are an open project, we prefer cooperation rather than competition, so we invite everyone interested in participating in the making of the camera, and then get one, rather than financing a concept where they are not involved. We believe that film photography can be revived by projects that deliver reliable products, and that all the knowledge all around it could, and should, be funneled towards the creation of a new market concept, where companies and projects bring together their best knowledge to involve more and more people around photography. In this way we will create a long lasting market and not a bubble, in this way we will attract larger investment by the giants in this world. We will be more than happy to discuss our ideas with everyone.